Homing pigeons provide an excellent model system for studying group the pros and cons of living in groups. This includes aerodynamic interactions, group decision making and navigation, behavioural and personality traits and energetics. My current research is looking at how different members of a group contribute to route learning, and how this interacts with physiological parameters. Pigeon work is ongoing, both writing up and finishing work with the Structure and Motion Lab (Royal Veterinary College), and beginning new group dynamics work mixed with physiology and behaviour. This work is in collaboration with Dr Dora Biro at the University of Oxford (see ‘People’), and our PhD student Lucy Taylor (see ‘Group’), who has just started the main body of her BBSRC funded PhD focusing on pigeon group physiology. One of the main theories that has persisted to explain this distinctive ‘V’ formation is that birds are attempting to conserve energy by taking advantage of the upwash vortex fields created by the wings of the birds in front. Aerodynamic theory has subsequently been used to predict where birds should optimally position themselves in relation to other members within the V, to maximise these energy savings. These predictions, however, are based on a fixed-wing principle, like that of an aeroplane for example; very different from the scenario of a flying bird and flapping wing. 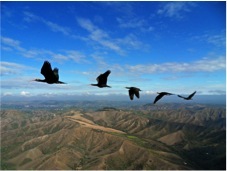 Our research on V formation flight is focusing on two migratory flights of the critically endangered Waldrapp Ibis (Geronticus eremita). 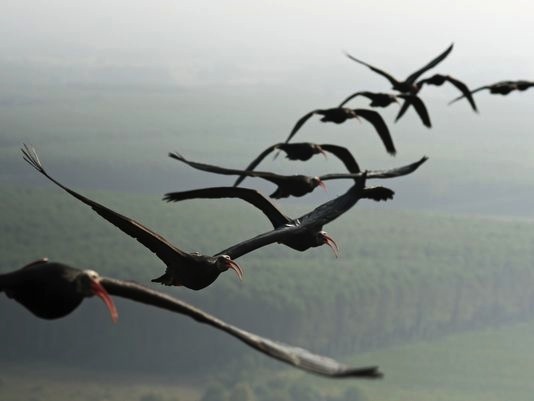 This opportunity was made possible by human-led migrations taking place in Austria as part of a reintroduction scheme, via the Waldrappteam, whereby imprinted young ibis are taught to follow a microlight. Short daily flights help the birds learn the migration route from where they were hatched in Austria to their wintering grounds in southern Italy. We equipped the ibis with data loggers, to investigate positioning within the flock, and the aerodynamic interactions taking place between individuals. The work has now been published in Nature (see publications).